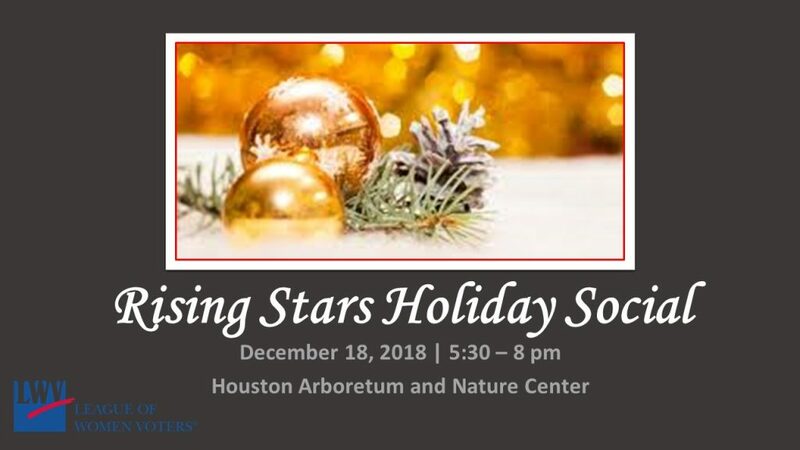 Join the League and our Rising Stars for a holiday social! Tuesday, December 18, 2018 at 5:30 p.m.
Beer, wine and light bites will be provided. Grab your favorite flashlight! You won’t want to miss a special Arboretum Night Hike led by Rising Star Kathryn Campbell. Entry fees will benefit the League of Women Voters Education Fund, which enables the League to serve Houston with indispensable, nonpartisan voter services, including voter registration, candidate debates, forums, and our popular Voters Guide to the Election and the Candidates. More about our generous host: The Houston Arboretum & Nature Center is a 155 acre nature preserve with 5 miles of hiking trails located on the western edge of Memorial Park. They are known for unique trails, wildlife viewing, opportunity to escape the hustle and bustle of city life, and for renowned educational programming. Find out more information about upcoming programs and fun events at www.houstonarboretum.org.